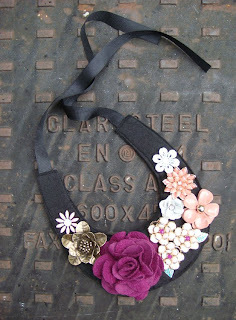 The statement necklace is autumn/winter 2009's big jewellery trend. So be style-savvy and get set for the season ahead with this embellished number from Accessorize. Rocking Chanel's spring/summer look with the mutiple flowers, it's a key piece that will continue to bloom right through the autumn and winter months. I love the juxtaposition of the understated felt-and-ribbon bib-style 'chain' with the luxe bead, metal and fabric floral 'pendants' - it's both not too dressy and completely and utterly so. Which makes it the perfect accessory for day or night. From a plain cotton-jersey top for work to a LDB for the evening, the rule is to keep everything else simple and let the necklace do the talking. You see, it doesn't take a huge investment to get your wardrobe new-season ready - £12.50, in fact (it's half price in the sale!). Now that's what I call a class-A bargain.